Welcome to the next post in my blog series, How to Start & Grow Your Email List! Over the last few weeks, we’ve covered why it’s important to have an email list, what to offer your audience to convert them to subscribers, and how to create an opt-in freebie your audience will love. If you’ve missed a post in the series, here’s a directory. Today, we’re tackling ways to promote your opt-in freebie to drive readers to your landing page and convert them to subscribers. Some of these ways are a little more extensive than others, while some are super easy. Mix and match different ideas to see what works best for attracting your audience or focus on one way to promote your opt-in freebie at a time. The choice is yours! 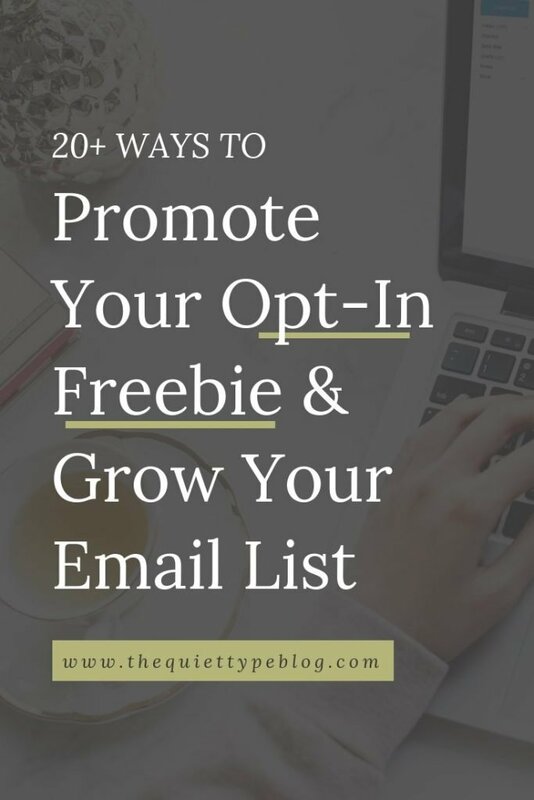 Without further ado, here are 20+ ways to promote your opt-in freebie and grow your email list. When you create an opt-in freebie, you’ll need a landing page to go with it. When someone clicks the link to your freebie, the landing page is where you’re going to hook them and ultimately convert them from a reader to a subscriber. Including these things will help with conversion because the reader will be able to see the value your freebie will offer them. Pinterest is one of the biggest traffic drivers for bloggers. 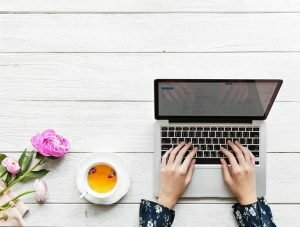 With the right strategy, bloggers are able to direct traffic to their blogs with little effort and getting readers to your landing page will be a piece of cake. Unlike posting to social media, your pin is constantly in rotation because it’s being pinned by other Pinterest users. 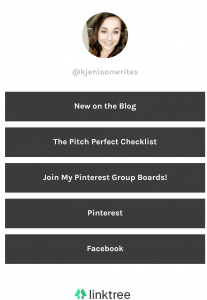 Create 3-5 different pins for your opt-in freebie and link it to the landing page. Make sure to test out different designs with A/B testing to see what works best for your target audience, too. If you’re new to Pinterest, I recommend investing in a course like Pinterest Ninja or Making Pinterest Possible to get a full picture view of all the ways to use Pinterest and how to do it successfully. I’ve used both courses personally and they did wonders for me! 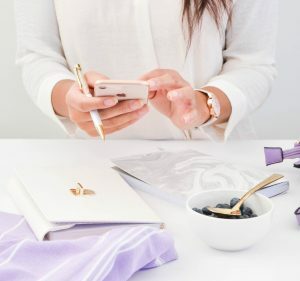 Creating an account with Tailwind also makes promoting your opt-in freebie on Pinterest even easier to pin your opt-in freebie pins to relevant boards on autopilot. 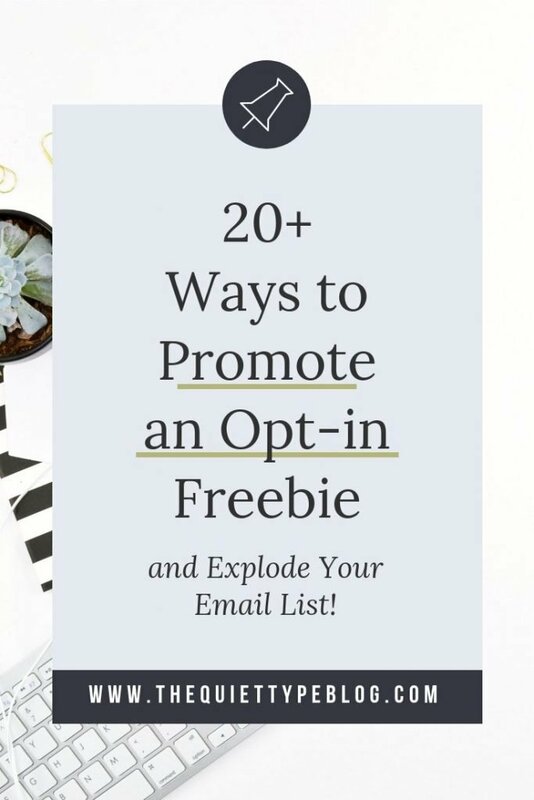 Promote your opt-in freebie in relevant blog posts. 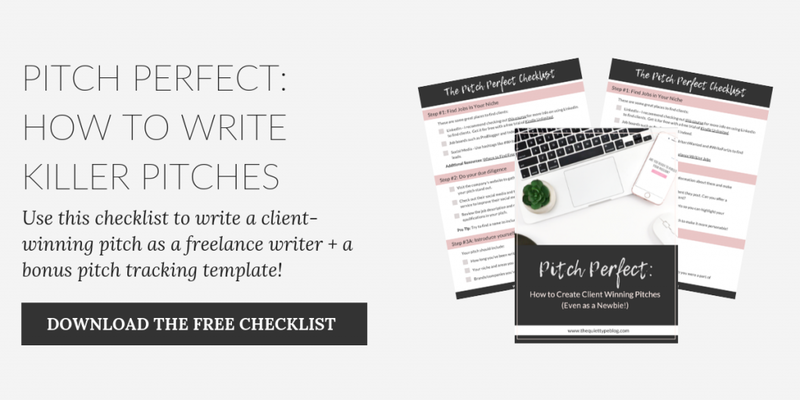 For example, I can promote my opt-in freebie on how to send client winning pitches in blog posts about where to find freelance writing jobs, how to get started freelance writing, etc. Just include links to your freebie’s landing page, or my favorite way to promote an opt-in freebie inside a blog post is with a linked graphic like the one below. Similar to promoting your opt-in freebie in a relevant blog post, you can create a “teaser” post to promote your opt-in freebie. 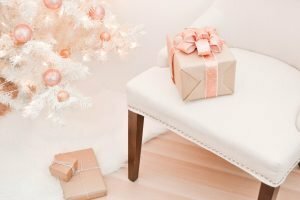 This works great for a content upgrade freebie because you can create a blog post that leaves your readers wanting more information. For example, you could write a blog post about why bloggers should define a niche and then offer a content upgrade like a list of 50 of the most profitable blogging niches. I recently found a plugin called Simple Author and it’s one I never knew I needed. Basically, it’s a plugin that inserts an author bio at the end of your blog posts. While this may seem repetitive if you have a bio in the sidebar of your blog posts, it gives you another place to get in front of your readers while also promoting an opt-in. Just insert the link to your freebie’s landing page at the end of your bio and invite readers to check it out. It’s a great way to link to your freebie in every blog post without it appearing irrelevant. When commenting on other people’s blogs, there’s often a place to provide the link to your website. Rather than leaving a link to your homepage, promote your opt-in freebie by leaving the link to it’s landing page. Unfortunately, Instagram only lets users have one working link in their Instagram bio. To bypass that, many users have created “menus” using services like linktree to link to several places at once. Promote your opt-in freebie by creating a button in the menu that links to the landing page. Users can even track the analytics of the links they use, which is extremely handy. Resource libraries are awesome tools for bloggers because you can keep all of your freebies, best content, and affiliated products in one place for your audience. Promote your resource library in blog posts, on social media, and with Pinterest pins, and let your audience pick which freebie suits their needs the best. This really only works if you have a podcast, but I think it’s a really creative way to promote your opt-in freebie. I wouldn’t have ever thought of this but it’s something Jenna Kutcher does on the Goal Digger Podcast. For a while, she stopped accepting sponsors for the podcast and instead promoted her freebies during commercials. Pop-up boxes are work wonderfully to promote your opt-in freebie, and what’s really cool about them is that they can set up to display when someone enters your site, as well as when they leave it. Rather than a generic “sign up for our newsletter” incentivize your readers by offering them the freebie. Don’t forget to check out the other blog posts in this series!